The formal program began with Board President, Joan Marren welcoming guests and thanking sponsors for their support of NEF’s mission. Representatives present from sponsoring organizations were introduced, as were the four members of the staff of the Jonas Philanthropies present, Wanda Montalvo, PhD, RN, Executive Director; Grants and Programs Manager, Althea Hicks; Manager of Development and Partnerships, Mary Fiore and Executive Assistant, Maggie Gelwix. Special guests, Norman and Alicia Volk, 2017 NEF Honorees were also acknowledged. 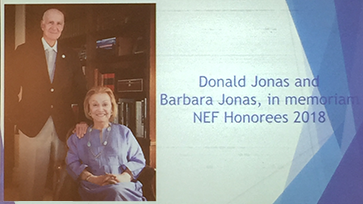 Margaret McClure, NEF Board Member Emeritus, and long standing member of the Jonas Philanthropies Advisory Committee then spoke about the Gala honorees, Donald and the late Barbara Jonas, who recently passed away. Margaret highlighted the work of the Jonas Philanthropies and their many years of active support for the nursing profession as well as their commitment to Veterans’ Health Care. Dr. McClure noted that the impact and reach of the Jonas Philanthropies has been nation wide as Jonas Nursing Scholars have hailed from every state across the United States. Dr. McClure expressed deep sorrow on her own and on behalf of NEF at the passing of Barbara Jonas on October 23, 2018. Her vision and commitment will be greatly missed. Joan Arnold, NEF Treasurer then introduced Nancy Roecklein, two time NEF Scholar and founder of the Circle of Scholars and Jennifer Withall, Circle of Scholars Ambassador. Jennifer spoke about the significance of the Circle of Scholars as a platform for all NEF scholars to communicate with each other and share their achievements with the public through updates on the NEF website, Linked-In and Facebook. It was quite fitting that Nancy Roecklein as an NEF Scholar role model introduce the 2018-2019 NEF Scholarship recipients who were in attendance. Nine of this year’s 26 NEF Scholars and their family members attended the Gala reception. Their presence and vitality was truly welcomed and celebrated. Nancy shared information about each of the recipients and presented them to the Gala attendees. They included: Camille Amada, Lienhard Schol of Nursing, Pace University, Jennifer Dillon, Rutger’s University School of Nursing, Athena Ford, Johns Hopkins University School of Nursing, Annie George, Adelphi University College of Nursing and Public Health, Kattiria Gonzales, Binghampton University Decker School of Nursing, Tanya Lott, University of South Carolina College of Nursing, Colleen McGauley, Boston College School of Nursing, Megan Moyer, Villanova University, M. Louise Fitzpatrick College of Nursing, and Manka Nkimbeng, Johns Hopkins School of Nursing. We offer our congratulations and best wishes to these and all the 2018-2019 scholarship winners! The biographies of all the scholarship winners can be found on our web site, www.n-e-f.org, under “Scholars”. We hope that the 2018-2019 NEF Scholars will continue to engage with NEF as their education continues. After the NEF Scholars were introduced, Joan Marren introduced Olive Glasgow, from New York City, a member of Freemen’s Hospital Nursing Alumni Clubs, Inc. which annually support the Estelle Massey Osborne NEF Scholarship and thanked her for attending. Finally, we extend our thanks to the generous sponsors of our 2018 Gala fundraising event that are presented on the homepage of our website to the right of this article. This year NEF raised more than $31,000 in sponsorships, one of our best ever results! We are most grateful to our very generous patrons and hope that they will continue to support the mission of NEF in this way. President, Nurse Educational Funds, Inc.